This heart blood test panel is helps screen heart health. What is this heart blood test panel? This heart blood test panel checks the CRP, homocysteine and standard lipid panel blood levels. Why is this heart blood test panel important? This heart health lab test panel evaluates standard heart health risk markers. This Heart Blood Panel is a blood test. This heart blood test panel, also known as a heart health lab test panel, screens lab markers related to cardiovascular health. This heart blood test panel includes the CRP test, homocysteine test, and the lipid panel test. Heart health blood testing is done to check blood levels of important markers that can signify an increased risk of a cardiovascular event like a heart attack. Early identification of abnormalities can be helpful as a motivator to help someone change their lifestyle (e.g. eat better, exercise more, stop smoking) and seek treatment from a medical provider. To get a heart blood test panel near you, simply order online and get tested at the lab location you selected. Once your heart health lab results are ready, they will be available for download. 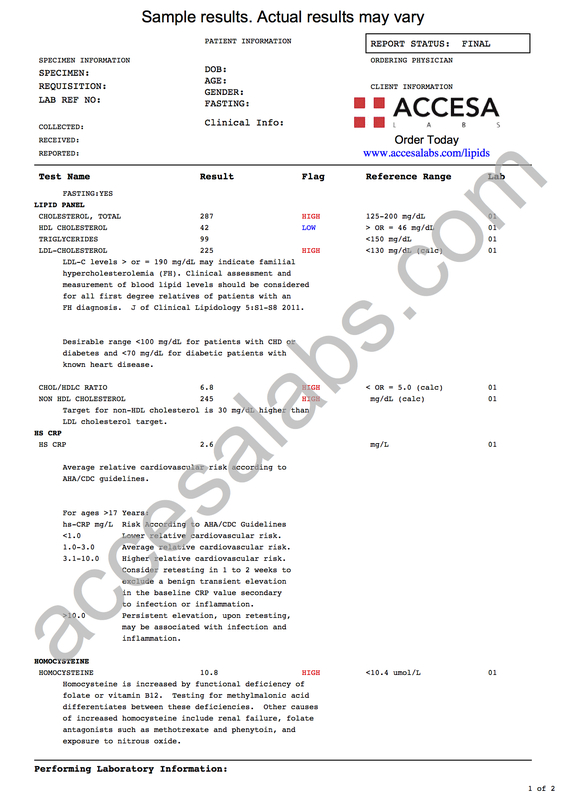 As can be seen on the sample heart lab panel results above, the lab results will be reported as a number which can be compared against the reference range provided by the lab. People who want a more detailed cardiovascular risk screen should consider getting the advanced heart health panel. For an even more comprehensive assessment, see the comprehensive heart health panel. Heart Blood Panel at Guaranteed Prices.